In this respect, the kitchen is just like the host: practical, welcoming and full of life! Which is why wine lovers often choose to store their best bottles there. Because shared moments, around a table or in a bar, are usually the perfect time for enjoying a glass of wine. Clean lines, ergonomic curves... Inspiration’s design was devised to be timeless, perfectly complement your kitchen and provide unprecedented ease of use. The air vent is invisible, the handles can no longer be seen and the hand grip is discreet. The bottles are lit by gentle amber lighting and the labels of your best bottles are beautifully set off by new shelves. The “plus point”: the control panel’s backlit touch controls give your kitchen a subtle, high-tech feel. A brand synonymous with quality, Inspiration benefits from all of EuroCave’s know-how, expertise and high standards in terms of storing and serving wine. 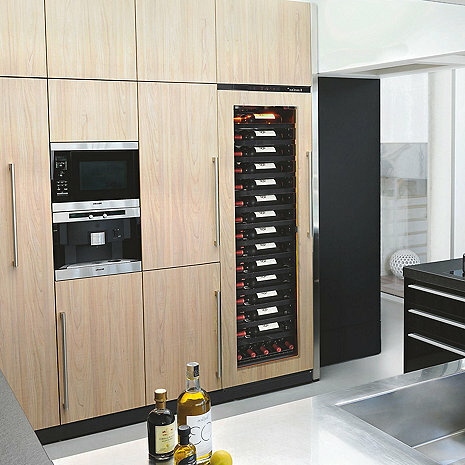 EuroCave, creator of the wine cabinet in 1976, offers long-term premium solutions. Inspiration cabinets guarantee a stable, controlled temperature, low energy consumption and low noise levels. To ensure the highest level of performance, cabinet bodies in the Inspiration range are equipped with high quality, durable materials: aluminium interior, reinforced insulation, high strength external panelling and a unique cabinet body design. Built-in or flush-fitted, the Inspiration range adapts to your kitchen and the space in which it is installed. Inspiration offers a choice of four cabinet sizes that can store from 17 up to 89 bottles! Size XS has a maximum capacity of 17 bottles. Size S is similar to “dishwasher” size and its maximum capacity is 30 bottles. You can store, display or stand your full or open bottles upright according to your requirements because Inspiration allows you the freedom to choose from three types of shelf! a wide choice of options to ensure your cabinet blends seamlessly with the rest of your kitchen. Inspiration benefits from all of EuroCave’s technology and reproduces all of the conditions required for optimal wine maturing: a constant temperature, humidity levels between 50 and 80%, a constant circulation of air, glass doors with highly effective U.V. screening offering optimal insulation and protection from vibration. Inspiration has cutting-edge interior equipment, specially designed to store your bottles in optimal conditions. EuroCave’s “Main du Sommelier” supports hold individual bottles and adapt to their shape. These, together with EuroCave’s unique shelf system ensure optimal protection from vibration. And for even better protection, all the cabinets in the Inspiration range are fitted with a safety thermostat, lock (depending on the type of door) and alarms to ensure that the cabinet is operating correctly at all times. -The Premium pack comprises 14 sliding shelves allowing you to store 89 bottles.